The Maharaja at Louie Vuitton Rockefeller in Manhattan in Sept. 1999. I used X-acto and Scotch tape to "drop" the car and lay the windshield back. Is this the most beautiful Deusie ever built? It was a monster of a car with 153.5-inch wheelbase, the longer of the two standard chassis built for Augie D's cars. After the chassis was built it was shipped to England where the coachwork was crafted. Then the car appeared in the London Motor Show where it recieved raves as "An amazing Colossal Car" before it was shipped to the USA. It was driven from NY to Auburn, Indiana for the ACD engineers to check everything out. Then it was driven it to the West Coast where it was shipped to India. The owner was a 28 year old Indian Prince, Maharajadhiraj Raj Rajeshwar Sawai Shree Yashwant Rad Holkar Bahadur of India. He had an square estate that was 100 miles on each side. When he would drive it the little red light on the fender would be illuminated and the people would lay prostrate at the side of the road as he passed. When his wife the Maharani would drive it, the green light would be on and they would politely stand by the side of the road and wave. The prayer rug on the floor of the car was rumored to be worth more than the car. The car was advertised FOR SALE in the NEW YORK TIMES in 1956 and sold for $6,000 to a man in Morristown, NJ. When the car came out of the jungle in India to be shipped it was cradeled in a sling between four elephants. Original plans by junior designer John Blatchley of the firm A. F. McNiel. Coachbuilder Gurney Nutting LTD of Croydon, England crafted the one and only Maharaja. I had a small picture of an oil painting of this car on the wall of my office for years because of its incredible beauty. I didn't realize that it was a real car, I just thought it was a painting. In September of 1999 when I unloaded my SCRAPE Zephyr to be exhibited in the Louis Vuitton exhibition at Rockefeller Center in Manhattan (a fabulous event that sadly no longer exists), the Maharaja was parked three cars away from my car. I freaked. Because I had credentials to get inside the barriers, I hovered over this car for three days and took several rolls of film. I studied the car and noticed that the shape of the rear decklid was "pointed" like my Zephyr. 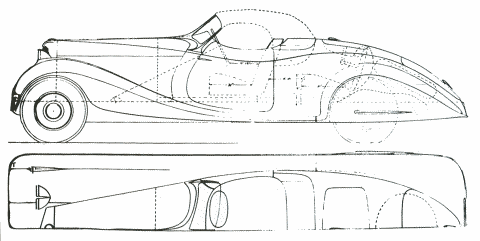 I noted that the profile shape of the rear fenders of the two cars was almost identical. The relationship of distance between the rear vertical rear door jamb and the leading edge of the rear fender was the same proportion between the two cars. The slope of the rear deck was similar. It was uncanny. I obtained plans of the Maharaja car (shown here) and compared them to my Zephyr in profile. While the Maharaja was much larger, when I shrank the plans down 10% and laid them over the Zephyr in profile, the rear 50% of the cars was a virtual match. I began collecting parts. I bought a pair of steel reproduction J-model front fenders and grille shell from Marcel's Custom Metal in Corona, CA, probably the top metal shaper in this country, and possibly the world. I bought a big pair of Lucas P-100 headlamps at Hershey. I bought a V-12 engine with 6 Weber two barrels. I had fiberglass molds made off the fenders and grille shell. Fat Man hisself, Brent Vandervoort, (right) and Mike Casanova fabricated the steel 2-piece hood and side panels with trick and challenging arched 3/4 louvers. Pete D'Orta and the infamous Mike "Bubba" Craig of Fat Man extended the frame from 125 to 148-inch wheelbase, put the body on the chassis, plunked in the V-12, hung the front fenders, grille shell and headlights on the chassis. As of this writing (May 2006) the car is in my garage in NJ. Ed Flanagan of Mendham, NJ is about to tackle the task of transforming the Zephyr convertible body into a 95% scale Maharaja. We may get Ramsey Mosher of RAM's ROD SHOP in Dover, DE involved in the completion of the 95% scale Maharaja (clone) project. It will be orange over black. Rumble seat decision to be determined. I've already got the Duval windshield frame for the car. Hopefully it will only take a year or so to complete. But heck, I've been swooning over this car since I saw the real one in September of 1999. I know it will be worth the wait.